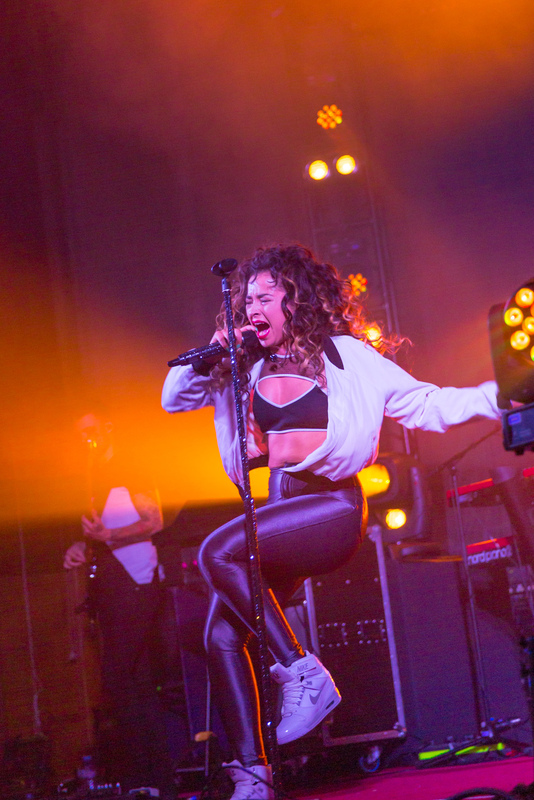 I can pinpoint the exact moment I became a full-blown, bona-fide Ella Eyre fan. It was about 25 minutes into her set at the Summer Ball. The energy of the room was flagging; people were taking their shoes off, dancing less. The shouts were a little quieter, the singing a little less enthusiastic. People were starting to realise that getting drunk and dancing around a big room can be exhausting. Suddenly, we were. And so was she. 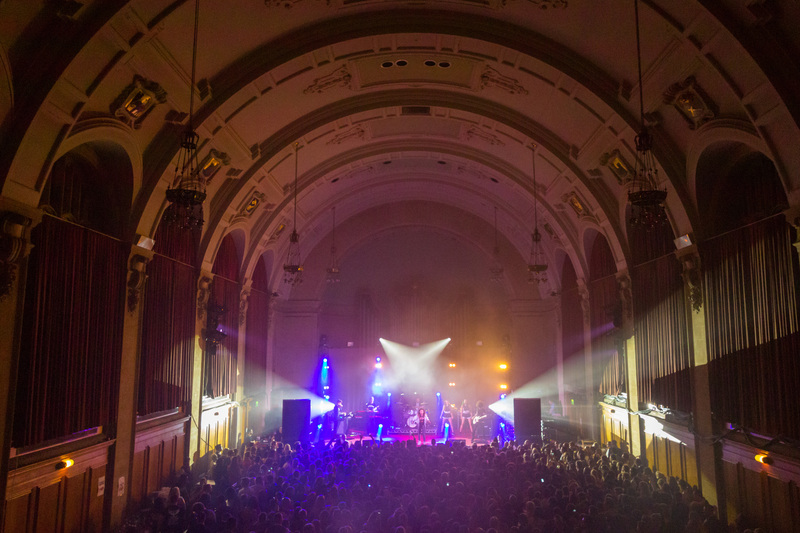 From the minute Eyre arrived on stage, she was in control. 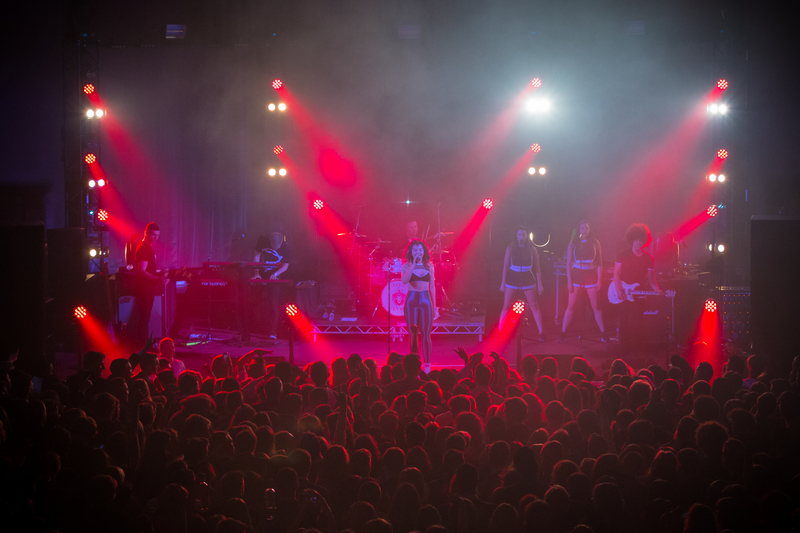 Her confidence belied her relative inexperience – she only released her first solo-single last year, and has yet to headline a tour – and every moment she was on the stage was pure electricity. From her swaggering intro, all the way to her head-banging finale, she owned the stage, fully and unapologetically. Of course, she didn’t do it alone. The backing singers/dancers followed in Eyre’s lead by completely owning the stage and the performance, strutting and swaying from song-to-song as the room heated up and the crowd built up to the crescendo performance. Ella bounced of her backing band nicely, enjoying a fun rock-and-roll moment as she head-banged with her guitarist and shimmied past the bassist. 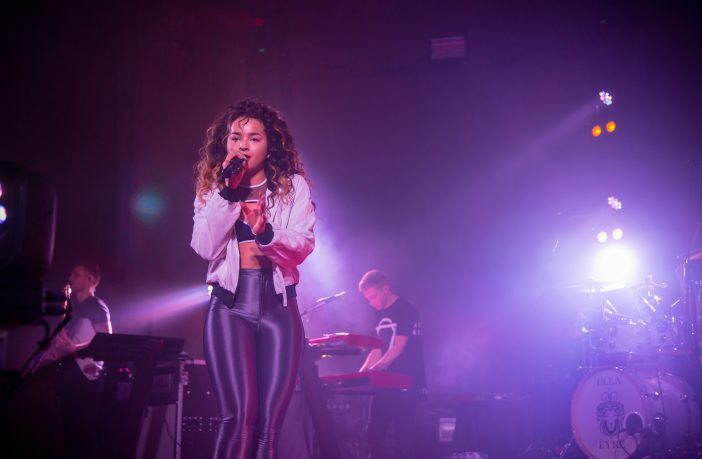 As with any inexperienced performer, there was a worry about the lack of material, especially considering the fact that Eyre has yet to release her debut album (titled Feline) which has a tentative release date of August 14th. It took Ella about five minutes to quash those fears however, as she engaged the crowd from the get-go, encouraging us to chant along with her during her opening song, Comeback: “Let that mother**ker burn!” And we chanted and sang-along throughout the set, as Ella Eyre taught us choruses and hooks, holding out her microphone to the audience to hear hundreds of drunk voices scream back at her. She saved the big ones, the number-one and top-five collaborations with Rudimental and DJ Fresh, until the end. After the long wait, they didn’t disappoint. It was if the audience had been collectively holding its breath throughout her set, and here it was released, as hundreds of us danced and screamed along to the now familiar lyrics. I’m now at the point of the review where I have to attempt to find a fault with the performance, so I don’t end up writing a 500-word gushing review. But honestly? It’s impossible. Ella’s performance was, in my eyes, flawless, and she has gained at least one life-long fan. Probably hundreds, judging by the reaction of the audience in PJ Hall.